OOOOooo! 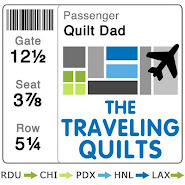 I'd love to use the new Joel Dewberry Line for this quilt! 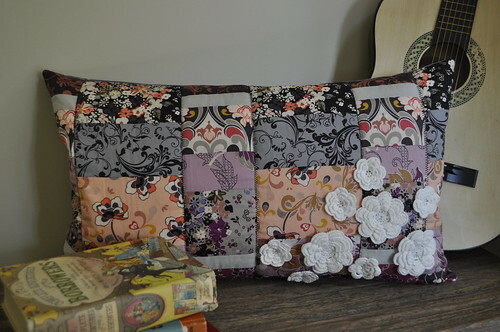 Throw in some Robert Kaufman Quilters Linen, and I think it would be sooo pretty ;D! Veronica, I'm happy to send you the book if you promise to send a picture of that sure-to-be-fabulous quilt! 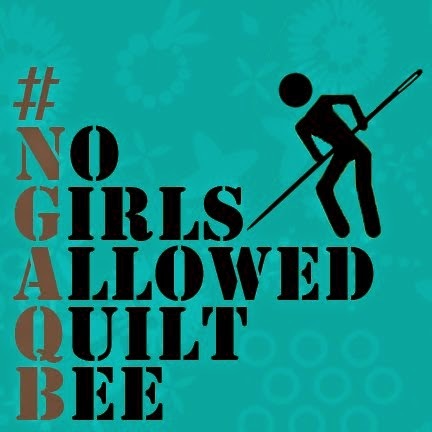 I'm back tomorrow with a new Fat Quarter Gang project for Art Gallery Quilts. See you then! I'm back today to bring you the final stop on the Skip the Borders Blog Book Tour. 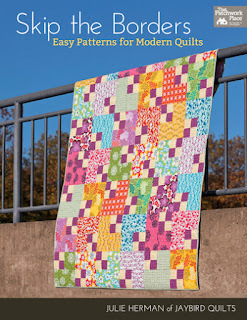 Skip the Borders is the first book by blogger and quilter extraordinaire -- and one of my bestest quilting buddies -- the always fabulous Julie Herman of Jaybird Quilts fame. 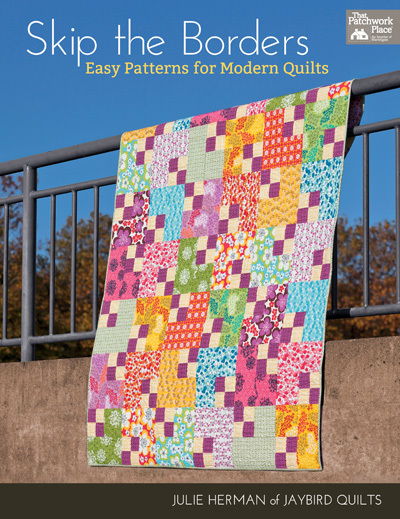 Skip the Borders is a collection of 15 quilt patterns, bound together by the fact that Julie has chosen to present them all without any borders at all. The running theme throughout all of the projects is that the designs themselves are the stars, and Julie shows them off by letting the design run from side to side and from top to bottom, without the framing effect of borders. The book, quite ingeniously, is broken out into three sections: one-block quilts, two-block quilts, and outside-the-block quilts. 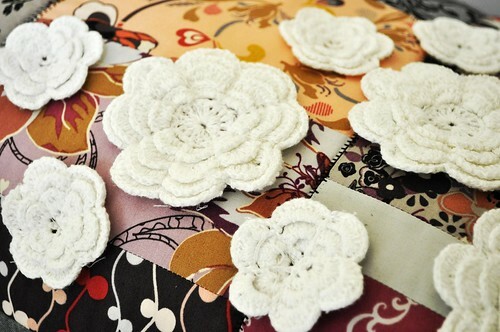 It's pretty amazing to see how Julie creates such large-scale, original patterns using such simple elements. And through it all, Julie brings all of the voice and personality that is such a signature of her blog. Her writing is very conversational, and I felt like I was sitting at market with her again! Instead of showing off several of the beautiful quilts in the book, I decided to just showcase my favorite. Box of Chocolates is one of the book's two-block quilts, and it is representative of some of my favorite quilts: simple to put together, a basic patchwork approach, and a design that showcases its fabrics. Plus, it may look like a square-in-square or log cabin block, but Julie introduces a strip-piece method to making these blocks that may surprise you. 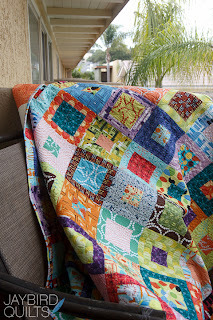 I love this quilt, and it's only one of the 15 great projects in the book. Check out some of the other photos on the other stops of the blog tour. The fact is, Julie is one of the best pattern writers in the business. Her patterns are easy to follow and accurate beyond belief. Plus, Julie always gives options to help personalize the quilt to best meet the quilter's needs. The book has a fantastic overview and basics section, which makes this a great book for beginning quilters. 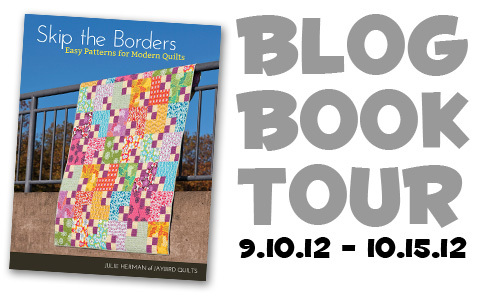 Julie and the fab team at Martingale are giving away an ebook copy of Skip the Borders to a lucky Quilt Dad reader. Want to get your hands on this awesome book? I know you do! Simply leave a comment on this post and tell me what fabrics you would use to make your own Box of Chocolates quilt. The pattern has such versatility, and I'd love to hear about all of the different ideas you have for this single pattern! I'll be picking a winner shortly.